Status: Abundant regular statewide spring migrant. Uncommon regular summer visitor central and east, rare west. Abundant regular fall migrant central and east, uncommon west. Rare regular winter visitor east and central, uncommon casual west. Documentation: specimen: caerulescens, UNSM ZM10619, 28 Mar 1917 Lancaster Co; photograph: atlanticus, taken of a specimen provided by Randy Buettner in spring, circa 2000, by William Lemburg (Silcock 2004). Taxonomy: Two subspecies are recognized (Gill and Donsker 2017): caerulescens, breeding from northeast Siberia to northwest Canada, wintering in the southern United States and northern Mexico, and atlanticus, breeding in northeast Canada and Greenland, wintering on the Atlantic Coast. The genus Chen was recently lumped with genus Anser based on genetic studies (Chesser et al 2017). Until the late 1960s, the blue and white color morphs of Snow Goose were treated as separate species, westerly-distributed Snow Goose, A. hyperborea, and easterly-distributed Blue Goose, A. caerulescens. Their breeding ranges had been separated until range expansion led to mixing of the two phases in the 1930s (Cooke et al 1995). Genetic studies established that they were indeed color phases of a single species (Cooch 1961). Breeding populations tend to migrate as a unit and at this writing the white phase overwhelmingly predominates in the Nebraska Panhandle, whereas both phases occur in eastern Nebraska. Essentially all Nebraska Snow Geese are caerulescens, but there are six records of eastern atlanticus (see Comments). Changes since 2000: Snow Goose occurrence and distribution patterns in Nebraska have been dynamic for several decades, especially as overall numbers have increased dramatically over time (USFWS 2017). In some areas of the breeding range, numbers increased 25 fold during a 25 year period in the late 20th Century (Mowbray et al. 2000). We anticipate occurrence and distribution patterns will continue to change in the future. Spring: There are several winter and summer records that make it difficult to determine spring arrival and departure dates, however during mid- to late Feb or early Mar a large influx of hundreds of thousands or even millions of birds are observed across the state. Arrival of the large influx and the duration of their stopover in the state is generally dependent on weather. In some years, peak migration is short-lived and a majority of birds may move out of the state within a week. In other years, especially during period of prolonged wintry weather, large numbers may remain in the state for 1-3 weeks. Vrtiska and Sullivan (2009) estimated between 1.3 to 7.3 million “light geese” (Snow and Ross’s Goose) stopped-over in the Rainwater Basin and central Platte River Valley during the period 2001-2003. High counts: In the Rainwater Basin and central Platte River Valley: 2,000,000 in the central Platte River Valley 15 Mar 2004, 2,000,000 at Harlan Co Reservoir, Harlan Co, in the central Platte River Valley 23-26 Feb 2005, and 1,500,000 at Harlan Co Reservoir 27 Mar 2013. In the east, 500,000-1,000,000 at Branched Oak Lake, Lancaster Co 2 Mar 2017, 500,000 in Platte Co, 26 Feb 2016, and 150,000 over Nemaha Co 11 Feb 2017. In the west 50-75,000 in Scotts Bluff Co 11 Mar 2008, and 20,000+ at Lake McConaughy, Keith Co 17 Mar 2001. A carefully-documented estimate was made of 1,074,080 passing over Nuckolls Co from 10.20 am to 12.16 pm on 4 Feb 2017 (David Ely, personal communication). Summer: There are many summer (May-Sep) records, often involving injured or diseased individuals, although apparently healthy singles and small groups are not uncommon, especially in the Rainwater Basin. Numbers are lowest late May-late Sep. Evidence for nesting is equivocal. The propensity for injured birds to summer, along with their healthy mates, may be interpreted as nesting by some observers. However, there is no undisputed evidence of nesting in Nebraska. Ducey (1988) discussed published reports, two of which are indicative of nesting. Swenk (Notes Before 1925) relates that a nest with eggs along the Platte River south of Kearney was seen by C.A. Black (Black 1908), although when Black arrived the nest was destroyed but still attended by two Snow Geese. Four Snow Geese were said to be nesting at Home Lake, Sheridan Co, in 1929 (Ducey 1988). Two additional undocumented reports of breeding are on file at NGPC: a pair with young was observed Jun 1990 at Willow Creek Lake SRA, Pierce Co, and two goslings were produced by a pair, one of which was injured, at a recharge lake west of York, Hamilton Co in 1996. High counts: 90 in the eastern Rainwater Basin 1-2 Jun 2001 (Jorgensen 2012), 50 there 20 Jun 2009, and 50 there 6 Jun 2010. Fall: Migrants are often observed in early to mid-Oct. An early flock of 95 was flying south over Seward Co 9 Sep 1999. Fall migration is variable and is dependent on weather and food conditions, as well as hunting pressure. Snow Geese may remain well into Dec and into Jan in mild winters. Far fewer occur in the west in fall than in spring (Rosche 1994, Brown and Brown 2001). High counts: In the west: 7200 at Lake McConaughy 21 Dec 2003, 1075 at North Platte NWR, Scotts Bluff Co 9 Nov 1997, 850 at Enders Reservoir, Chase Co 26 Dec 2003, and 800 at Whitney Lake, Dawes Co 19 Nov 1994. Winter: Numbers are generally lowest 10-20 Jan; 600 were at Sutherland Res, Lincoln Co 19 Jan 2019. However, as many as 50,000 have remained near Clay Center, Clay Co in mild winters (Joe Gabig, personal communication) and more recently 30,000-40,000 have been recorded during the mid-winter waterfowl survey conducted by NGPC in early Jan (Mark P. Vrtiska, NGPC, personal communication). Small groups occasionally move north into the state in mid-winter from overwintering areas in Kansas and Missouri during extended warm spells, but the species may also be mostly absent during very cold winters. Comments: Occurrence of atlanticus in Nebraska was discussed by Silcock (2004), who cited five documented records 2000-2003. In addition to the five records cited by Silcock (2004), a further record is of a single atlanticus, collar # JK41, seen 15-16 Mar 2002 in Thayer Co (Kathy Meeres, personal communication). Recent years have seen a shift westward by atlanticus from its traditional Atlantic Coast migratory route which has led to the occurrence of low numbers, estimated at fewer than 30 birds annually, in the Central Flyway (Silcock 2004). Snow and Ross’s Geese over Funk WPA, Phelps Co., 28 Feb 2007. Photo by Joel G. Jorgensen. Mark P. Vrtiska provided numerous helpful comments that improved this species account. Black, C.A. 1908. 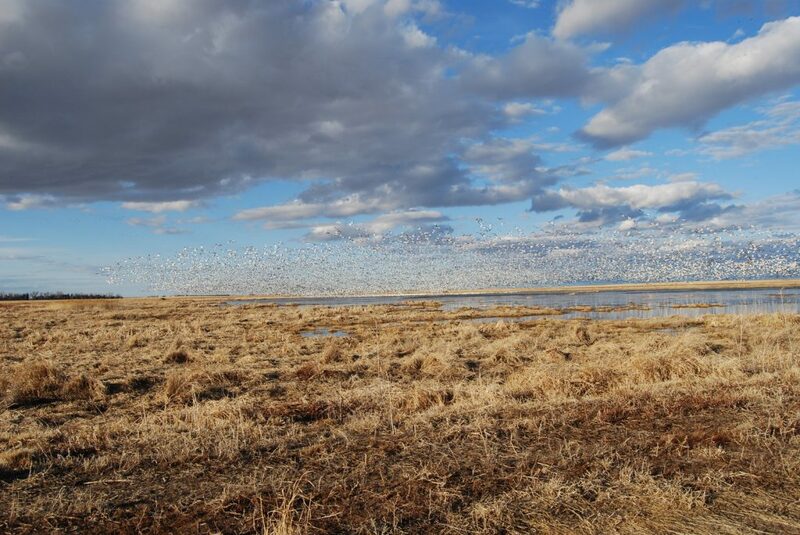 Breeding of the Snow Goose in Nebraska. Warbler 4: 15. Cooch, G. 1961. Ecological aspects of the Blue-Snow Goose Complex. Auk 78: 72-89. Cooke, F., and G. Cooch. 1968. The genetics of polymorphism in the Goose Anser caerulescens. Evolution 22: 289-300. Silcock, W.R. 2004. The Greater Snow Goose (Chen caerulescens atlanticus) in Nebraska. NBR 72: 104-108. U.S. Fish and Wildlife Service. 2017. Waterfowl population status, 2017. U.S. Department of the Interior, Washington, D.C. USA.